4.9 x 3.8 x 2.8 in. Nikon's mid-level DSLR line gets a solid upgrade in the form of the D5500, now the smallest and lightest DSLR yet made by Nikon. But don't let the small form factor fool you, as there's a lot of firepower packed inside this little gem. Amazingly small for a DSLR; Great image quality for its class, including superb low light and high ISO performance; Generous JPEG buffer depth; High resolution. Buffer depths are shallow when shooting RAW; Lacks GPS from the predecessor; No AA filter means it's susceptible to aliasing artifacts. 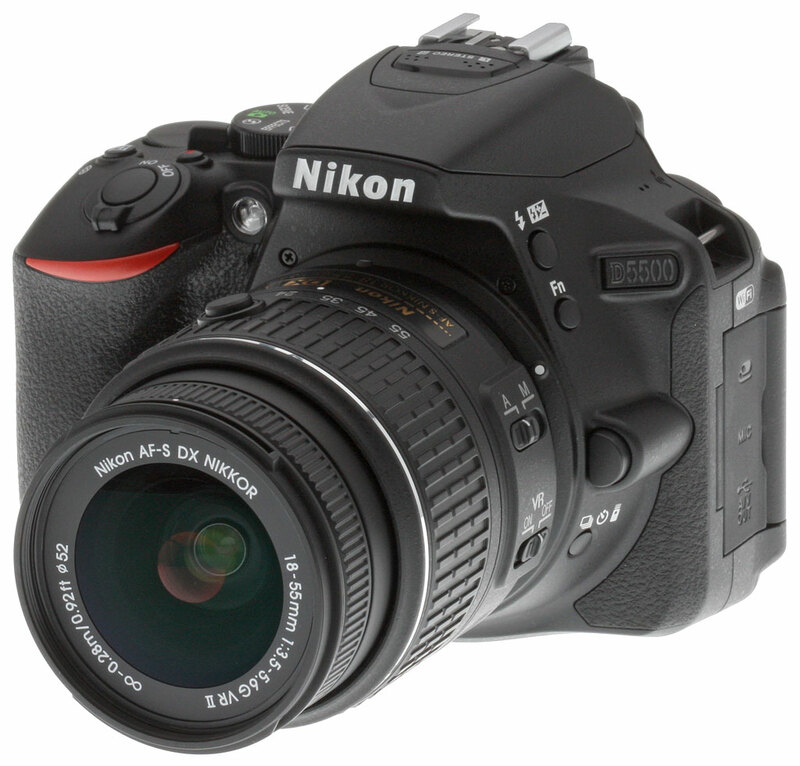 The Nikon D5500 became available in February of 2015 for an MSRP of $1000 with the 18-55mm kit lens. It is now available in a body-only configuration for around $750. The Nkon D5500 earned our Best Intermediate DSLR award in 2015 and was a Camera of Distinction for Overall Achievement as well. Its successor, the D5600, offers similar image quality and performance but is available with a newer kit lens that features a focus motor that is smoother, faster and quieter than the D5500's kit lens. The D5600 also adds Bluetooth LE and NFC for Nikon SnapBridge compatibility, however it loses a few features as well. See our Nikon D5600 review to see if the updates are worth the ~US$100 premium for the newer model. With the D5500 DSLR, Nikon aims to repeat the success of the earlier D5300, which launched back in October 2013. We greatly enjoyed shooting with the earlier camera, which received a Dave's Pick thanks to great image quality, solid performance, good handling and the convenience of built-in Wi-Fi. 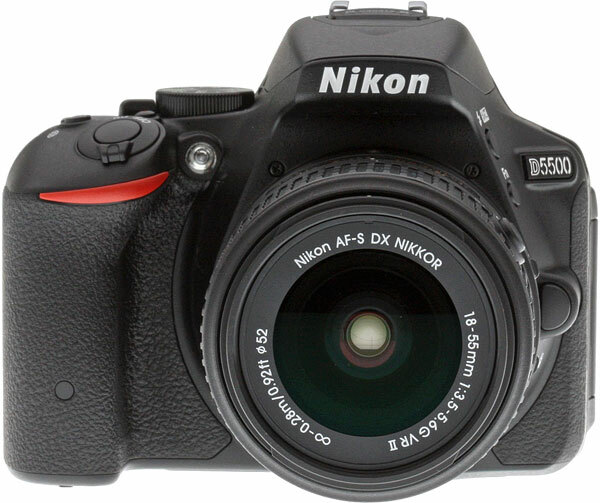 Now, the Nikon D5500 builds on this with significant upgrades in several key areas. Key among these changes is a brand-new body that's smaller (4.9" x 3.8" x 2.8") and lighter (14.9 oz, body-only) than ever before -- in fact, even the entry-level D3300 isn't as compact. The 24.2-megapixel Nikon D5500's body features similar construction -- the company refers to it as a carbon-fiber monocoque structure -- as was used previously in the D5300, but with a slimmer, deeper grip. The D5500's new body brings with it control improvements including a relocated Info button, and a simplified Mode dial that does away with the numerous fixed scene mode positions of the earlier camera. Nikon has also added a touch-screen overlay to the D5500's 3.2-inch LCD monitor, allowing it to serve as an input device, and providing consumer-friendly features like a touch shutter and pinch zoom. Just as with Wi-Fi on the earlier model, this is a first for a Nikon DSLR. And courtesy of electronic improvements including a new proximity sensor that disables the LCD monitor when you raise the camera to your eye, battery life has been extended by almost 37%. Also retained from the D5300 are Nikon's 39-point phase detection autofocus system, which features nine cross-type points, and its 2,016 pixel metering system which is paired with Nikon's proprietary Scene Recognition System algorithms. The company has also retained the same versatile side-mounted, tilt/swivel LCD articulation mechanism, and the in-camera Wi-Fi support of the D5300 also carries over, as noted previously. So, too, does a burst capture rate of up to five frames per second, achieved thanks to an EXPEED 4 image processor. Other changes in the Nikon D5500 are to be found in firmware. The new model now sports a Flat picture control for both movie and still capture, which is more conducive to color grading post-capture, and the D5500's picture controls allow finer-grained 1/4-step adjustments. There are also several new effects modes and a clarity control, as well as the ability to lock the cable release for continuous long-exposure shooting with shutter speeds of four seconds or greater. There is, sadly, one feature subtraction. Unlike its predecessor, the D5500 no longer sports a built-in GPS receiver, so if you want to geotag your images, you'll need to do so manually or rely on an external device to record a location track that can be imported later. Available since February 2015 in black or red body colors, the Nikon D5500 is priced at US$900 or thereabouts, body-only. Two kits with bundled lens are also available, with the AF-S DX NIKKOR 18-55mm f/3.5-5.6G VR II kit priced at around US$1,000, and the AF-S DX NIKKOR 18-140mm f/3.5-5.6G ED VR kit at US$1,200. Having shot with film for about 25 years up until 2006, I finally took the digital plunge and cut my teeth on the now legendary Nikon D40, a real ground-breaker of a camera for its time and price point, which brought enthusiast-grade performance and image quality to the masses, and myself. (Our D40 is still going strong almost a decade later, though has long since been "acquired" by my wife.) Since joining IR three years ago though, I've primarily worked in the mirrorless world, including reviews in the PEN line from Olympus and the NEX-gone-Alpha line from Sony among others, and have not had much recent DSLR experience other than a brief period with the D3300 for an indoor sports on a budget article. But that experience, coupled with the first time I picked up the D5500, led me to want to come full circle and dig back into the mid-level DSLR world. In my first Field Test for the D5500, I took a look at the positive ergonomic changes to this popular line, and began exploring the extensive ISO range that this rather affordable camera yields. For this second report, I'll be examining how the ISO range pairs with the continuous autofocus and burst performance by attempting to conquer the toughest photographic terrain: capturing fast motion in low light. As I mentioned at the onset of our Indoor Sports on a Budget tutorial, capturing fast motion is fairly easy if you have a lot of outdoor ambient light, and capturing images in low light is fairly easy if your subjects aren't in motion. But attempting to capture the combination on a budget can be daunting! Most pros and even seasoned enthusiasts often pair high-end, full frame DSLRs, which have excellent continuous autofocus performance and solid high ISO performance, with lenses that have bright, fast apertures to accomplish this rather difficult feat. Those gear assets coupled with a lot of practice and real world experience all merge to create the ability to capture crisp and tight images of athletic motion in challenging low light environments. Here we present crops from our laboratory Still Life target comparing Nikon D5500 image quality to its predecessor, the D5300, as well as against several competing models at similar price points or in similar categories: Canon T6i, Olympus E-M10, Samsung NX500 and Sony A6000. NOTE: These images are from best quality JPEGs straight out of the camera, at default settings including noise reduction and using the camera's actual base ISO (not extended ISO settings). All cameras in this comparison were shot with our very sharp reference lenses. Clicking any crop will take you to a carrier page where you can click once again to access the full resolution image as delivered straight from the camera. But how does it look on paper? Where the Nikon D5300 upped the ante in print quality and sizes compared to the heralded and award-winning D5200, the D5500 takes image quality to a new level for this line in the print world. Surpassing the D5300's usable print sizes at ISO 200, 400, 800 and 25,600, and yielding generally crisper prints overall, the D5500 makes a strong showing in the price-to-quality as well as the size-to-quality categories, and certainly excels in the print quality department. Read our Nikon D5500 Print Quality analysis for more details! What's under the hood of the new D5500? Sensor. At the heart of the Nikon D5500 is a new 24.2-megapixel, APS-C sized image sensor. (That's DX-format in Nikon parlance.) As in the D5300, which had the same sensor size and resolution, there is no optical low-pass filter over the sensor, ensuring maximum possible resolution, but perhaps at the risk of moiré or false color artifacts with certain subjects. Processor. The D5500's sensor hands off data to Nikon's proprietary EXPEED 4 image processor, the same type as used previously in the D5300. Sensitivity. Sensitivities on offer in the Nikon D5500 range from ISO 100 to 25,600 equivalents. That's the same range as was available from the D5300, but unlike that model, the entire range is now available by default. In the earlier camera, sensitivities above ISO 12,800 were available only with ISO expansion enabled. 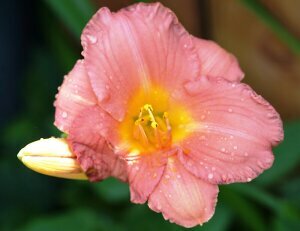 The change suggests that Nikon now feels image quality at the highest sensitivities will be greater than from the D5300. The Nikon D5500 raises the bar in Nikon's mid-level DSLR line-up, blending a smaller form factor with improved image quality, excellent dynamic range and improved performance in many areas. It ranks among the elite cameras for low light and high ISO performance in this class and price range, making it an intriguing option for shooters wanting to take their game to the next level, and also for a higher-end Nikon shooter wanting a capable back-up in their bag that they can depend on. The D5500 sports a few notable improvements in the ergonomics department, including a more professional grade rear control dial, a simplified, sleeker mode dial than its predecessor, and the addition of touchscreen functionality to its vari-angle LCD. The maximum native ISO has also been raised to 25,600, and we found in our print quality analysis that you could, indeed, manage a good 4 x 6 inch print even at that lofty setting, which again the D5300 was unable to achieve. Large capacity SDHC/SDXC memory card. 16GB Class 10 should be a minimum. Suggestion for improvement? Head over here.